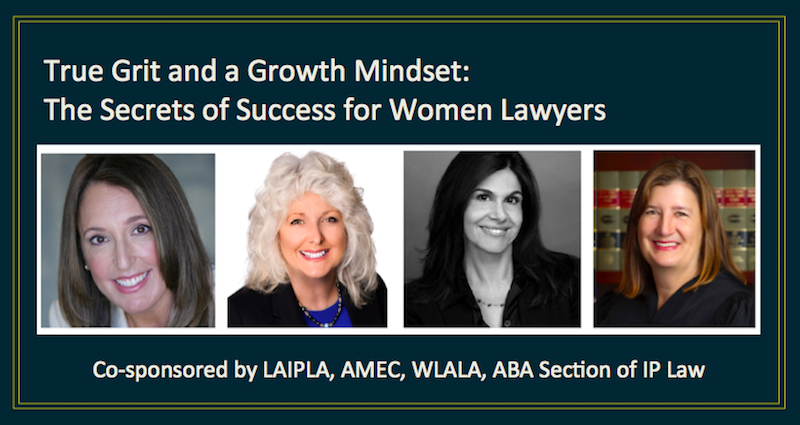 Grit and Growth Mindset – characteristics that many successful women attorneys have in common – may matter more than other measures such as IQ, class rank, or law school. This program educates participants about the science behind these traits, provides attendees with tools to assess their levels of grit and growth mindset, and gives practical advice to incorporate these concepts. We will discuss grit and growth mindset as applied to situations such as engaging in negotiations, making a pitch, motion practice, and handling a heavy workload. Ultimately, these traits can be taught and leveraged to enhance the quality and effectiveness of women lawyers. Come learn from our esteemed panelists as they discuss how they have utilized grit and growth mindset to overcome obstacles and achieve success. **MCLE: One hour of CA State Bar elimination of bias credit. Parking is available in the building for $15.00 after 5 p.m. Additional parking is also available at Westfield Century City Mall, one block away ($3.00 for 1.5 hours, $1.00 every 30 minutes thereafter).